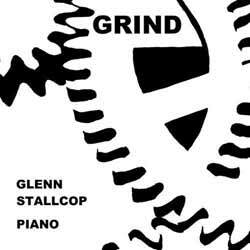 Glenn Stallcop's Grind sees the composer performing a number of pieces for solo piano that tackle various aspects related to work. From daydreaming to stress, Stallcop converts his ideas in to music. For those that have followed Stallcop's work to date you'll already know what you're getting here. For the uninitiated... you're either going to love it or not get it at all. Although, I'd strongly advise you to stick with it, because out of what at first appears to be chaos and segments thrown together with little thought, soon emerges a mini work of art. The composer also provides notes on each track and the inspiration behind them and while it's not essential that you know this information to get the most out of each track, it is interesting and allows you to take a peek behind the curtain into Stallcop's process. The album contains 11 tracks (1 hr, 02 min, 58 sec).